Dorothy I’m Not in Kansas Anymore! Frankly I am not sure if I’m still in Costa Rica for goodness sake! I’ve gone from pleasant hard-working Ticos who are clean freaks with an obsession for being on time to Rasta Regae time where it took 45 minutes to track down the key to my “room”. Alexander (one of Wolf’s trusted lieutenants)(where the hell is spell check!?) (wait I found it disguised as “proof read writing” button) couldn’t figure it out cause the key hanging on room 4’s hook had 7 on it… an obviously sophisticated security system that is above my pay grade. In case you haven’t figured it out yet, I am on the south Caribbean coast of Costa Rica at a tiny place called Playa Chiquita, just south of the “thriving metropolis” of Puerto Viejo. I am experiencing as much of a culture shock going from Fortuna to Playa Chiquita as I did from Vancouver to Fortuna. I’m staying at Playa Chiquita Lodge, owned by a German man named Wolf who arrived here 31 years ago and started buying land between bouts wildness I’m sure. They built this …. not sure what to call it… collection of duplex cabins strung along a wooden board walk that morphs into a dirt lane that takes you to our own beach. The epitome of rustic, they are charm with a good dose of rough around the edges. I spent the first 3 days having seriously cold showers where I kept yelping in pain from the iciness of the water. (how the hell does the water get that cold in this country?) I was to the point of leaving because of it. I mean I’m pretty tough, I did tepid for the first 2 weeks with nary a whimper but this was brutal. When I complained to my lovely Dutch couple ( “my lovely Dutch couple” :}… I think everyone should have one, don’t you think?… Rachael and Edwin I miss you!) about it they looked confused and claimed they had tons of hot water. Everything went real quiet in my head (not a common occurrence I assure you) and I knew what had happened – the pipes got switched so that cold came out of the hot side and yes, the hot came out of the cold side. All those painful showers when the hot water was laying so close. damn. 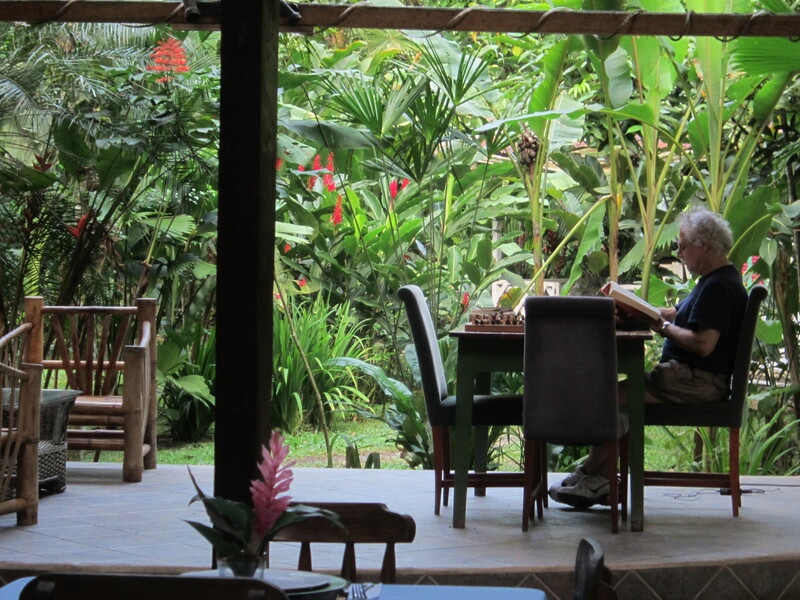 Joe enjoying a quiet early morning read in the library - a la Costa Rica style. There is a large communal area with a mini-library, a dining room and a kitchen that everyone seems welcome to use. The place is populated by a gaggle of young uns’ underfoot who “volunteer”, Wolf, a cranky Chow (a breed that should never be allowed below the Canadian/US border) and a wonderful large black dog of who knows what pedigree. A wonderfully electic selection of salsa, opera, jazz and 40’s makes me feel like I’m in a Hemingway book. My major complaint of the place is that I am so far from the ocean, I can neither see nor hear it. This seems like a common occurrence along this stretch of paradise, having the hotels far from the water but claiming it is but a “short walk” to the beach. Seems that “a short walk” is a very subjective description. The side window by my bed. 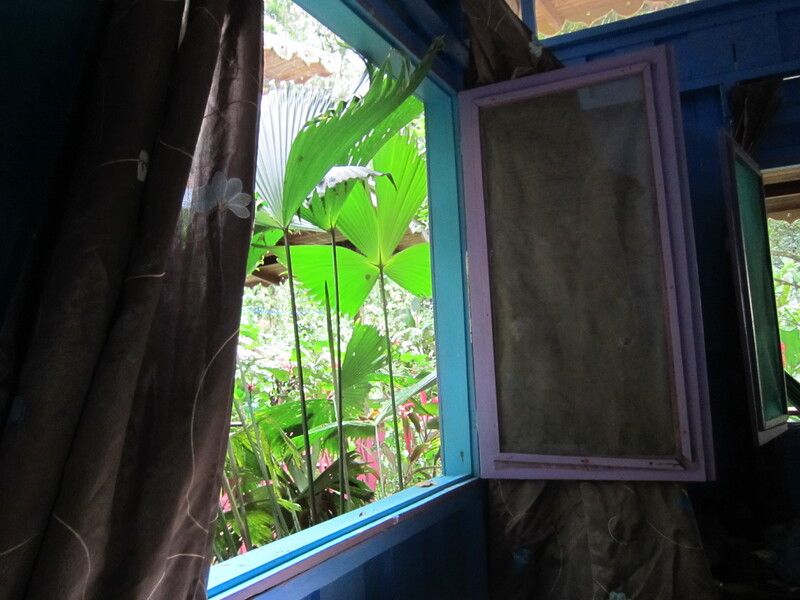 However my room is delightful, 2 large screened windows give me a good breeze (when one is to be had in the jungle). The screens are quite thick so you can barely see through them but the other morning on my day off I threw them open and ohmygoddess! What a wonderful view! Like I had the jungle right in my room. I curled up and read and drank coffee and was almost purring with contentment. There was even a large eagle in the tree mere feet from my balcony. 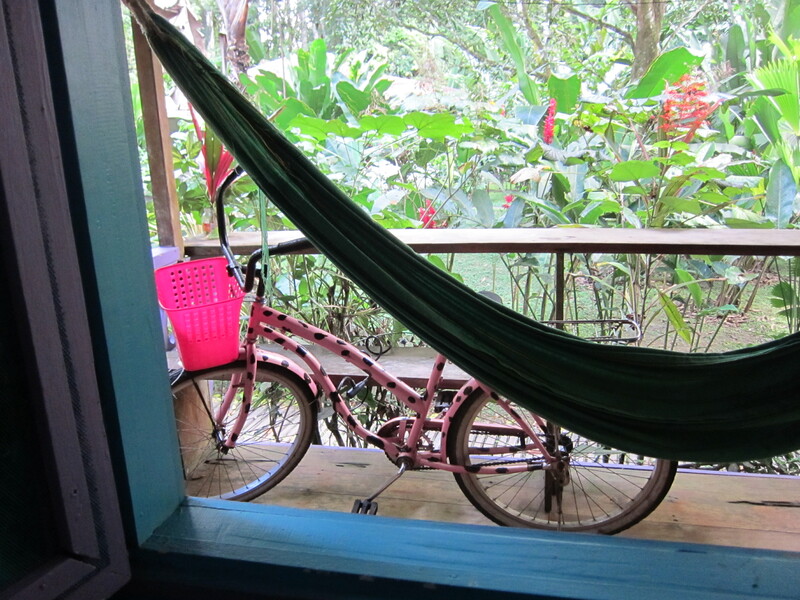 My front porch & my pride & joy - The Pink Panther Bike! How Do You Choose Your Vacation Location? 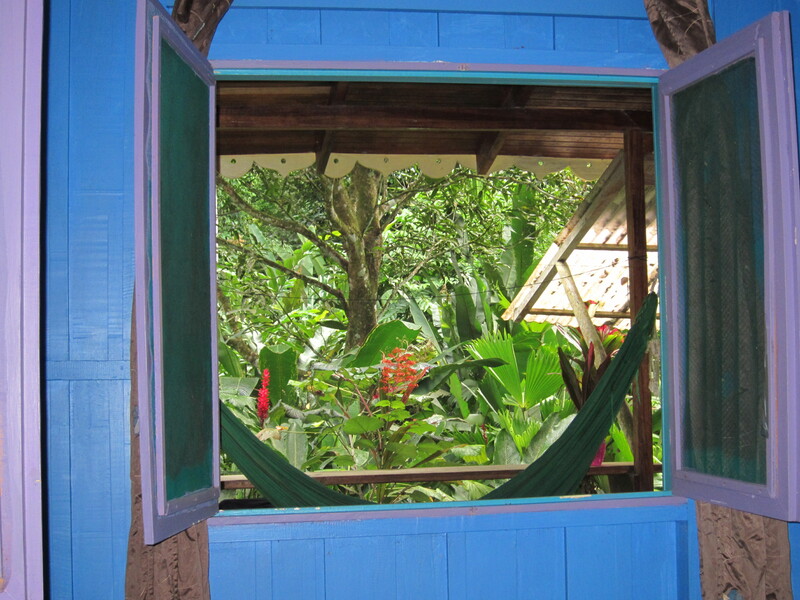 Costa Rica… the night before I leave. Wanted to let you know, I got Monkeys are made of chocolate on my kindle while we were waiting at the airport and am really enjoying it. Great tip! Have a great time there, looking forward to reading your adventures! Glad you are enjoying the book, guess we’re all going to have to meet at Hacienda Baru sometime, eh?